Current US EPA Administrator Scott Pruitt on May 9th signed a memorandum establishing a “back-to-basics” approach to Clean Air Act-required reviews of National Ambient Air Quality Standards (NAAQS). On any given day, you are likely to see EPA approve and promulgate Clean Air Act State Implementation Plans (SIPs) in the Federal Register. Find out what goes in a State Implementation Plan and how EPA regulates air pollution sources in states or terretories without a unique Plan. In this week’s EPA Enforcement Roundup, a midstream natural gas firm, an eyeglass lens manufacturer, and a packaging company face fines for noncompliance with EPA air, water, and chemical regulations. EPA extended the deadline for public comments on its proposal User Fees Rule under TSCA and released supplemental findings regarding small businesses in the chemical sector. What Is the Hazardous Waste Derived-from Rule and How Does It Work? The “derived-from” rule—found at 40 CFR 262.3(c)(2)(i)—states that, unless excluded, a waste generated from the treatment, storage, or disposal of a listed hazardous waste is also a hazardous waste. The derived-from rule intends to prevent generators and TSDFs from circumventing the land disposal restriction requirements that apply to a waste the moment it’s generated. See EPA enforcement actions that colleagues can learn from? Post them on Lion’s Facebook page here. 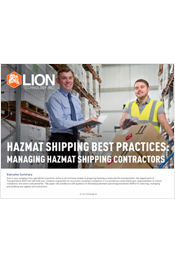 Like Lion’s page, so you never miss an update about DOT hazmat, hazardous waste, OSHA workplace safety, and EPA compliance. The US Coast Guard today announced increased civil penalties for maritime violations, including hazardous substance and oil discharges and hazardous materials violations. Four popular Lion Technology training programs have been nominated for Best Safety Training 2018 in ISHN’s Readers’ Choice Awards! Submit your vote and let the world know you completed the best training available. Do You Need an SPCC Facility Response Plan?